A close-up of the intricate stone work on the temple’s façade. Detroit’s neo-gothic Masonic Temple towers over the Cass Corridor, a midtown stretch containing two historic districts and some of the city’s most striking design. The temple is the largest of its kind in the world, standing as a testament to the teeming behemoth of a city that Detroit once was, and its resilience in the face of economic fallout and population decline in more recent years. 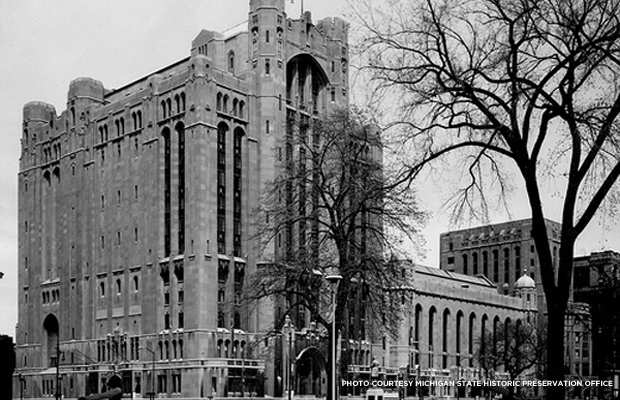 Like the rest of the city, the Masonic Temple, built in 1926, had seen better days. In April, Detroit news outlets reported that the Temple had been foreclosed on, and that the building owed over $150,000 in back taxes to the city of Detroit. With 1,037 rooms, including state-of-the-art theaters, ballrooms and banquet halls, the structure is a community resource as well as an architectural marvel. The temple was built in 1926 and occupies a city block in Detroit’s Cass Corridor. The endangered building’s plight caught the attention of rock musician Jack White, who grew up in the Motor City. His mother was hired as an usher at the temple during a period when she had trouble finding work, and White himself cut his teeth in the music industry by playing gigs at venues like the Gold Dollar in the Cass Corridor, just half a block away from the temple. When he eventually did take the stage at the Masonic years later with his band The White Stripes, it was tangible proof that his career had come full circle. 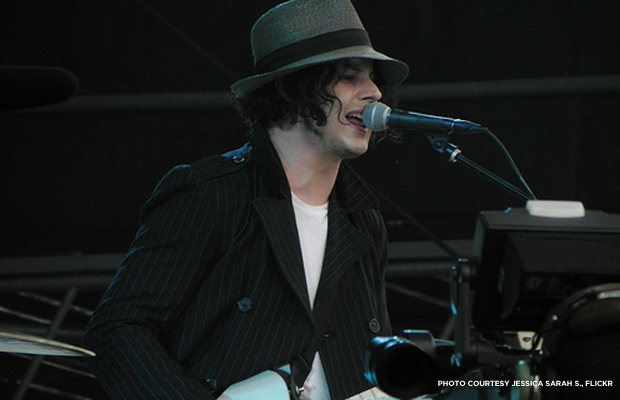 Jack White performs at San Francisco’s Outside Lands music festival in 2012. Dizik explains that the structure was never, in fact, in foreclosure, but that the temple had a deal with Wayne County to incrementally pay off the back taxes. Still, White’s donation of $142,000 ensured that the temple was out of debt, and that it could continue to host concerts and other community events for years to come. White made the donation anonymously, but the temple made an offer to rename its 1,586-seat Scottish Rite Cathedral Theater performance space the Jack White Theater in his honor. “His management team came back a couple weeks ago and said they would accept the offer to rename the theater,” Dizik says. 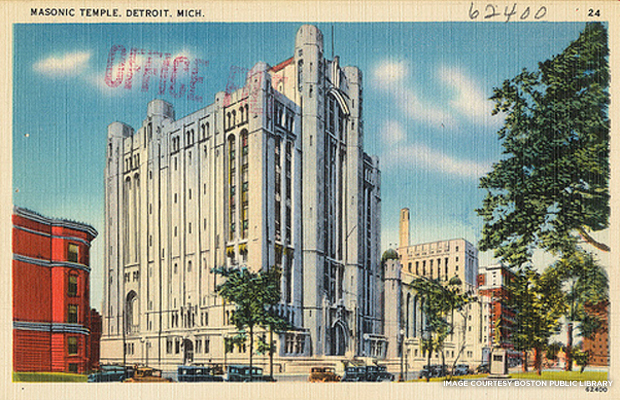 A postcard of the Masonic Temple, dating from around 1945. Things are changing in the Cass Corridor, too. The city of Detroit has plans for a new Red Wings hockey stadium to be built kitty corner to the temple, and Dizik explains that the temple will be undergoing modernization to keep pace with the new development. “We want to get folks as engaged as possible,” he says, encouraging community members to donate to the temple and come to upcoming performances, especially at the theater named in White's honor. 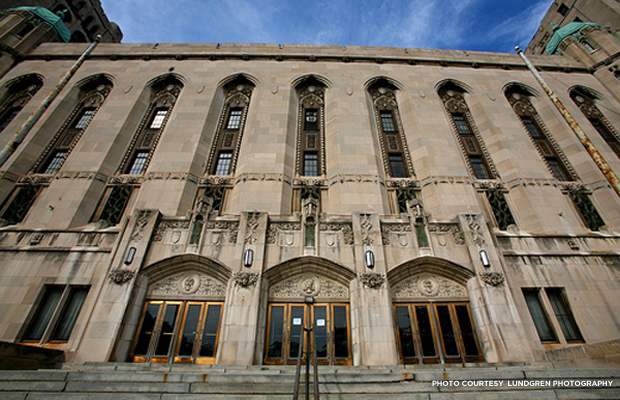 Follow the Masonic Temple on Facebook and on Twitter at @DetroitMasonic.